Attention! Marine Salt™ has been discontinued and replaced by our new and improved sea salt, Vibrant Sea™. Click here to learn more about Vibrant Sea™. Marine Salt™ is specifically designed to replicate the saltwater marine environment. It provides every major, minor and trace element necessary. This ensures that even the most delicate marine fish, invertebrates and plants will thrive. 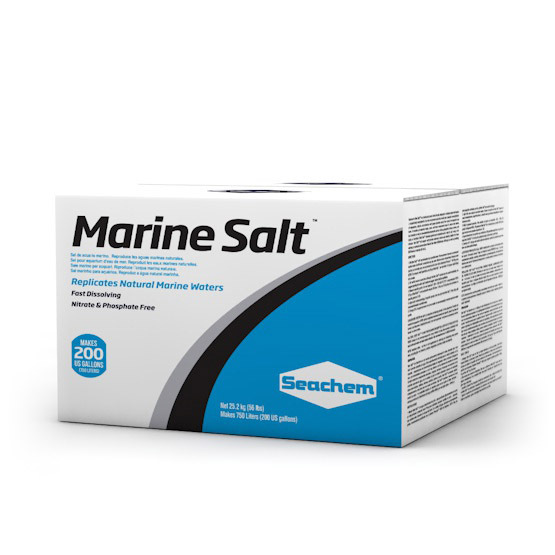 Marine Salt’s™ enhanced alkalinity ensures a more stable pH than competing salt blends. Marine Salt™ possesses excellent solubility characteristics and will provide a clear, ready to use solution in only a few minutes. 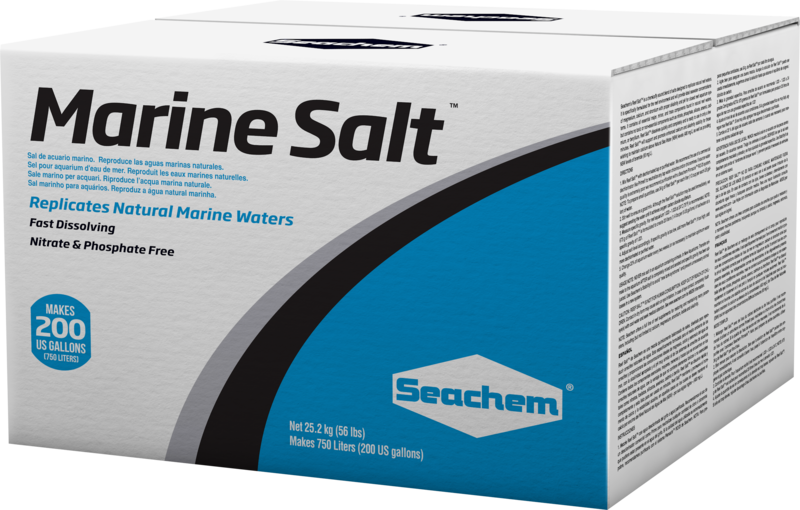 Marine Salt™ is a convenient and easy to use one-part formula that is ideal for mixing either small or large batches of saltwater. Utilizing state of the art production facilities ensures a consistent and uniform particle size that will not separate in packaging or shipping and will provide a consistent saltwater mix every time. For Reef environments, use Seachem Reef Salt™ instead. It is specifically designed to meet the requirements of a reef system. Mix Marine Salt™ with dechlorinated tap or purified water. We recommend the use of a commercial dechlorinator like Prime® to neutralize any tap water chlorine and/or chloramines. If source water quality is extremely poor we recommend purification with a Seachem Pinnacle™ RO/DI system. NOTE: To prepare small quantities, use 34 g of Marine Salt™ per each liter (1/2 cup per each US gallon) of water. Stir well to ensure a good mix. Although the Marine Salt™ solution may be used immediately, we suggest aerating the water until it achieves oxygen/carbon dioxide equilibrium. Measure specific gravity. Recommended range is 1.020 – 1.023 at 24 °C (75 °F). NOTE: 675 g of Marine Salt™ is formulated to create 20 liters (1.4 lbs per 5 US gallons) of saltwater at a specific gravity of 1.021. Adjust salt level accordingly. If specific gravity is too low, add more Marine Salt™. If too high, add more dechlorinated or purified water. Change 25% of aquarium water every 2-4 weeks (or as necessary) to maintain optimum water quality. USAGE NOTE: NEVER mix salt in an aquarium containing animals. In New Aquariums: Transfer animals to the aquarium AFTER salt is completely mixed and aerated and specific gravity has been adjusted. Use Seachem’s Stability® to avoid “new tank syndrome” and prevent unnecessary animal losses in a new system. CAUTION: Marine Salt™ is not for human consumption. Keep out of reach of children. Contact in dry form may cause skin or eye irritation. In case of eye contact, completely flush eye(s) with cool water and seek medical attention. See the bottom of this page for MSDS information.. NOTE: To control pH between water changes use Seachem’s Marine Buffer™. To restore trace elements between water changes use Seachem’s Marine Trace™ . Typical Ionic Concentrations of Marine Salt™. Units=mg/L. Levels will vary based on salinity. There are no questions about Marine Salt™. Ask us a new question.